Welcome to Taste the Cracklin, a company that means and represents a lot to many different people. For some we’re known for selling the best hog roast machines available on the open market, others know us for having a like-nothing-else hog hire service, but most, most know us because we represent the very best in hog roast and spit roast catering in liskeard. Taste the Cracklin is the most reliable hog roast liskeard caterer, with precise accuracy we serve our catering packages on the dot, at every event. Even extraordinarily large events that have guests in their thousands are no match for our gifted spit roast chefs. With a confident swagger your Taste the Cracklin chef will spit roast a pig to its perfect, scrumptious state. The sense of spit roast wonderment that will encapsulate your guests can come in a variety of forms. Don’t fancy spit roast pig? That’s okay, you can choose a spit roast lamb, spit roast turkey, spit roast chicken, spit roast chicken kebab, spit roast sirloin of beef or Britain’s best beef burgers and sausages, made by the chef himself. Need more than just a spit roast snack? Then we have the solution for you again, just pick one of our many menu packages which includes starters, canapés, side salads and potatoes, and a dessert. For our more expensive hog roast packages you’ll even have a front of house with your service, not to mention drinks and chocolates after your meal, and the optional add-on of a drinks bar to be operated throughout the evening(or day). Served buffet or sit-down, our hog roast menu packages are excellence personified and give new meaning to hog roasting – and they’re without limitation. A Taste the Cracklin team can be sent to hog roast for ten to ten thousand people. 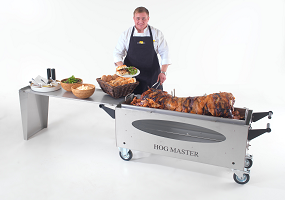 Hog roasting fits perfectly in your events indoor or outdoor environment, whether in the middle of the day or late at night. Better still, you can have the absolutely best of the two worlds with our services, if the rain starts coming down as it sometimes predictably does we’re one of the only caterers that can effectively change venues at the drop of a hat. So, if we’re outside serving a hog roast for a wedding reception and suddenly the weather takes a turn for the worst, not to worry, we’ll just move the hog roast machine inside and we can do that without any issues whatsoever. The ergonomics of our machine are designed with all uses in mind, which is where all these great hog roast catering benefits come from. The extensive menus, being able to cook for thousands of people, having the ability to switch from indoor to outdoor catering and vice versa in a few minutes? All these amazing benefits of our hog roast catering have their roots in our hog roast machines. We’re not telling you about our awesome machines just to show off and brag, the reason we’re talking about our machines is because the machine use isn’t just restricted to Taste the Cracklin catering, as we alluded to in the opening we have a ground breaking hog roast hire service that has everybody talking about hog roasts for a brand new reason. Not only is hog roast catering on the tip of everybody’s tongue, now the growing whispers about our machines, have grown into an audible sound that’s hard to drown out. With our hog roast service, you can benefit in many ways you couldn’t have dreamed of. At a fraction of the cost of hog roast catering you’ll have your very own hog roast – and if you use the machine personally you’ll have the bragging rights that comes with it! Your friends will be filled with envy when they turn up to your garden barbecue and see all the fun you’re having, they’ll probably want to get in on the action themselves and have a few minutes playing the hog roast chef. With the machine you’re in the driving seat of a culinary formula 1 car which will take you wherever you want. Lamb, pig, turkeys, you can cook them all with the Taste the Cracklin machine. But be warned, once you’ve hired a machine and seen for yourself the remarkable genius of hog roasting you’ll have a strong urge to come back to us again, and again, and again. If that’s the case and you want to hog roast whenever and wherever, buying a Taste the Cracklin machine is another option.